And maybe that’s the other connection (aside from poetry and comics) I see between Browning’s first ‘book-book’ (as people sometimes say) and Joe Brainard’s Collected Writings just out from the Library of America, which arrived in yesterday’s mail. As far as I know, all of Brainard’s writing, with the exception of Granary’s wonderful edition of I Remember, has been out of print for a long, long, time. So long in fact, that for writers of my generation and younger, the only way to read Brainard has been in special collections libraries. On a ‘now or never whim’ I bought a very rare copy Brainard’s Bolinas Journal a few weeks ago, in part, because it was the first book published by Bill Berkson’s by Big Sky Books in 1971. The cover mimics a classic composition notebook, and it includes journal entries and a lot drawings (some comics, some not) and holograph poems from Brainard’s first visit to Bolinas. I was worried that a book with so much graphic complexity wouldn’t be included in The Collected Writings, or worse, that the publisher would reprint the text and omit the images. But happily, it’s here, with all of the images and text that were included in the magnificent first edition, sans cover and colophon. It’s a very ambitious undertaking, a marvel to behold, and I’d like to extend my thanks to Ron Padgett for his dedicated work as editor of this book, as well as The Library of America for producing it with integrity and imagination. 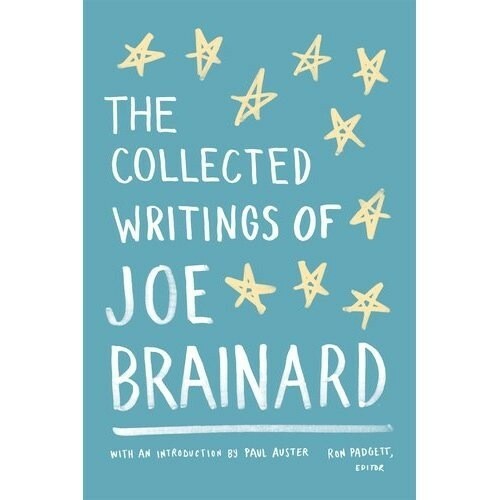 Together, they have made it possible for present and future generations to experience The Collected Writings of Joe Brainard.